We’re celebrating Independence Day on Wednesday, July 4th. It’s so nice to have a break from work mid-week. And I mean ALL WORK, including the kitchen. Along that line, I thought I’d end my holiday cookout by scooping some sorbet or ice cream onto a plate, adding a drizzle of Balsamic Cream®, followed by a garnish of berries. That’s as hard as I’ll work for this July 4th Sorbet with Balsamic Cream® recipe. 1. Place a scoop of sorbet on each of 4 individual bowls or dessert plates. 2. Add a drizzle of Balsamic Cream® and garnish with strawberries, blueberries and mint leaves. *Balsamic Cream® can be purchased at Wholefoods Stores® or online at Amazon.com®. Every year in December, my thoughts return to Montreal where I spent my early childhood. In Canada, the holiday season was synonymous with my cousins and me enjoying those great snowball fights. Here in Los Angeles, these delicious Snowballs are made with bananas that are cut into chunks, rolled in sour cream and then in coconut. Rather than throwing these Snowballs at anyone, it’s best to serve them on a festive platter, surrounded by lush, fresh strawberries. While Snowballs are fun to make, if anyone’s around during the process, these treats will never make it to your holiday table. But if they do, they’ll be the hit of the party – guaranteed! 1. Peel and cut the bananas into one-inch chunks (approximately 5 chunks per banana). 2. Place bananas in a shallow bowl and gently toss in the lemon or lime juice. 3. In a separate, shallow 10-inch bowl, gently stir together the sour cream and Amaretto liqueur; set aside. 4. Place coconut in a separate 10 or 12-inch shallow bowl and set aside. 5. Using two forks, lightly coat each banana chunk with the sour cream mixture followed by the coconut (roll each banana chunk in the coconut until it is thoroughly coated and looks like a snowball). 6. Place snowball on a serving platter. Repeat with remaining banana chunks and arrange in a mound on the serving platter. 7. Fan each strawberry by making two vertical cuts into it. Arrange strawberries in a circle around the Snowballs. 8. Refrigerate Snowballs up to three hours (covered in plastic wrap) or serve immediately. As a longtime Californian, I’ve traveled across the border to Mexico quite often. Its happy people, history, culture and foods fascinate me. No doubt, my Italian cooking has been “influenced” by the exotic foods of Mexico. For example, two weeks ago I wanted to make an Italian dessert known as Tiramisu, but I was out of ladyfinger cookies. Nothing could stop me from making something that tasted Tiramisu-ish! When I combined mascarpone cheese and espresso coffee with Mexican custard ingredients, this exquisite TiramiFlan was born! 2. Place sugar in a 12-inch, nonstick skillet over medium-high heat setting. 3. When sugar begins to melt, quickly change heat setting to low. 4. Lift, tilt and shake pan constantly to avoid blackening the sugar. 5. With a wooden spoon, gently stir the sugar – it will continue melting. When sugar turns amber throughout, immediately pour it into a glass pie plate. 6. Immediately lift and tilt plate until bottom and sides are coated with melted sugar; set aside. 1. Meanwhile, bring a full kettle of water to boil on medium heat. While waiting for water to boil, proceed to the next step. 2. In a stand mixer or in a 5-quart mixing bowl, beat together the condensed milk, Mascarpone cheese, eggs, vanilla and brewed espresso (on low speed); set aside. 3. Place the 13x13x4 square baking pan on an oven rack that is positioned in center of oven; pull the oven rack with the pan halfway out of oven. 4. Place the sugar-coated pie plate in the center of the square pan. 5. Immediately pour the liquid flan mixture into the pie plate. 6. Gently and carefully pour the boiling water into the square pan until water rises 2/3 of the way up sides of pie plate. 7. Carefully and slowly push the oven rack back inside oven. 8. Bake the flan 50 minutes. After 50 minutes, insert a pointed knife in center of flan. If knife come out clean, the flan is done. If not, cook an additional 10 minutes. 9. Carefully transfer the square pan with water and flan to kitchen counter to cool 30 to 40 minutes. 10. After 40 minutes, remove pie plate from water and set on counter. 1. When the flan is room temperature, refrigerate it for at least 4 hours or overnight. 1. After the flan has cooled 4 hours or overnight, pour 4 cups hot water in a 13x13x4 square baking pan or extra large glass bowl. 2. Gently place the flan pie plate in the hot water for 2 to 3 minutes. With a rounded knife or a spatula, gently loosen the sides of the flan from the plate. 3. Lift the plate out of the water and wiggle or shake it. When the flan has loosened from sides of plate, set it on a counter. 4. Place a large serving platter over top of the flan plate and, with one hand underneath flan plate and the other hand securely on top of the platter, make a quick flip. 5. At serving time, garnish the TiramiFlan with strawberries. Upon arriving at a Varadero Beach resort (Cuba) in June, I realized I had entered paradise. The pristine white sands against the turquoise ocean looked surreal. To add to this dreamy state were the tropical Caribbean trees and fruits. Truly vine-ripened in the sun, an array of sweet, luscious fruit is served at all hotel buffets. As I enjoyed pineapple for breakfast, lunch and dinner, I became inspired to create a refreshing dessert. I accented the pineapple with a favorite spice of mine, grilled it and served it with sherbet. The recipe is lots of fun for summer entertaining. 1. Working on a cutting board, cut off and discard pineapple stem with leaves as well as the bottom tip. 2. Holding the pineapple vertically, cut it into fourths. 3. Slice off and discard the ½-inch thick inner core from each fourth. 4. Insert a sharp, pointed knife between the pineapple skin and flesh. 5. Cut away the flesh from the skin in one piece (for all fourths). 6. Refrigerate two of the fourths in a covered bowl for future use (the extra pineapple can be eaten as a snack). 7. Working with two of the fourths (half of the pineapple), cut each fourth, crosswise, into 8 slices (a total of 16 slices). Set the slices on an aluminum-foil lined baking sheet. 8. Sprinkle the pineapple slices lightly with brown sugar and cinnamon. 9. Place the sheet with the pineapple on an oven rack set six inches away from oven’s overhead broiler grill. 10. 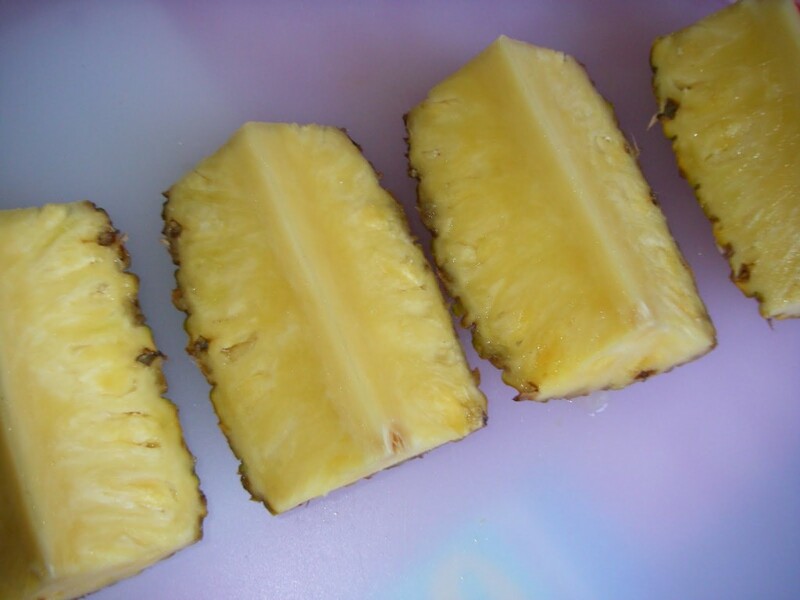 Broil/grill the pineapple for 5 minutes or until brown sugar begins to bubble. 11. Cool completely (this step can be prepared early in the day). To serve, place two scoops sherbet onto four individual dessert plates. 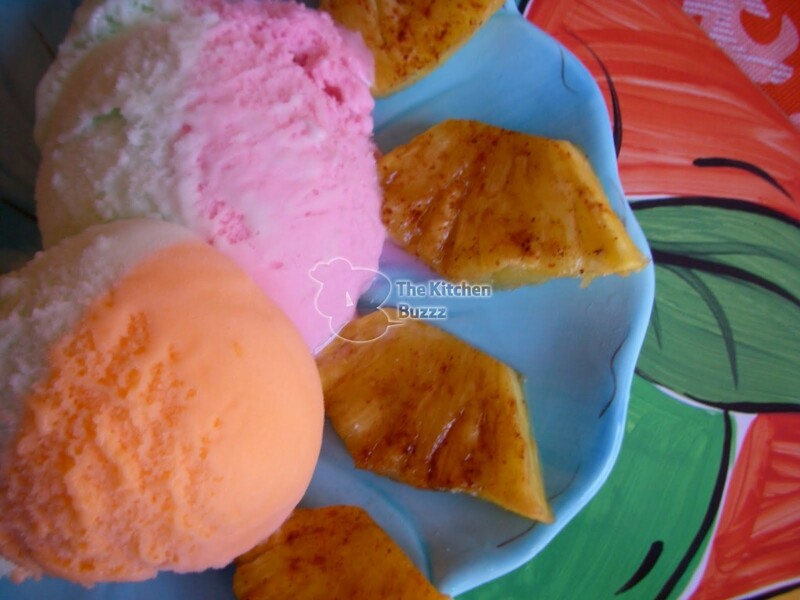 Decorate the sides of each plate of sherbet with four slices of pineapple.